Sean Dyche remains convinced that his methods and beliefs will dig Burnley out of their current plight. The Clarets go to Crystal Palace 17th in the Premier League, a point better off than bottom side Fulham, having won two of their 13 league games to date. It is the club’s poorest start to a Premier League campaign, but Dyche - never one to get too high or too low - is confident the culture which has served him so well in over six years at the helm will reap its rewards ultimately. 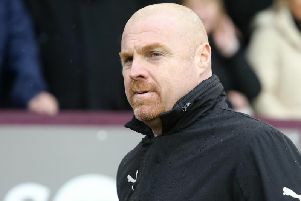 His players are renowned for having “no disappointments”, reacting well to setbacks, and, ahead of the trip to Selhurst Park, Dyche analysed what he feels they need to climb away from trouble: “I think players are obviously always looking for first of all an individual performance, because that’s important, team performance and to win games. “They certainly know all that here. “You can throw all these words around but the most pride that I find is a team that will give everything to win a game, because you can’t guarantee a result, but what you can guarantee is that you’re in the right organisation, the right feel, the right mentality, the right physicality. They’re all the boxes we’re looking to tick. “It’s too easy to throw around these words like confetti like pride and all that. If anything is hurt it’s just the fact that you’re a professional and all your life you’ve been striving to win football matches. While wins are the only statistics that matter in this situation, he insists Burnley’s numbers are starting to stack up in a promising fashion, and their resilience and relentlessness is returning: “I certainly think that it’s coming back to where it was, because it was stretched at the beginning of the season but not really by the mentality of the players, but by the physicality. They’re closely linked. “If you’re fatigued, your mentality gets stretched, whereas when you’re clear, fit, well – our stats the other day were back up way higher than two months ago physically. “There was a lot made of sprints for example and distance covered for example. It was 117km the other day. Big numbers, so that’s a nice shift. That means the feeling is coming back ready for the task. You add into that the technical stats. “I think we were the fifth highest passing team in the division (including the weekend) and it’s fair to say most people were saying that we weren’t. “Productive passing is what’s key, whether it’s long, short, it’s indifferent. The fact is you want to be effective. The other night we created three very high quality chances and four more which were at least good chances, so that’s a pretty high return, on top of stats, because that’s the inevitable stat. “They had blocks and long distance efforts, very few real efforts. “I felt a bit for Joe (Hart) on that one because he had to pick it out of the net twice and you can’t really work it out. “In amongst it all there’s a belief, there’s a way of working. I think the players are coming back to have that real clear-mindedness about what’s needed. Patience is in short supply in football, even for a man who led the club to their best finish in 44 years, a return to Europe after 51 years, and had a pub named after him. But for Dyche, it isn’t about patience, it’s about perseverance and trusting your beliefs: “I don’t think you can say patience, it’s just about believing in the process. “We’ve worked here for long enough to know that all adjustments made over those years have added, so all the new challenges and new experiences that the players are gathering from this season, they add layer up layer, but you’ve still got to apply the basics to all these different learning curves, and over the years we’ve done that well. “We haven’t really had that many bad runs over the last six years – one when a first got here, that was the half a year bit that wasn’t that much fun. “Last season we had one but it was different because we’d got so far but people said ‘that was bound to happen’, yet this season it’s not ‘bound to happen’, which is interesting because it’s a different mindset from outside looking in. Kind of a respectful one in a way, but it can happen. The Premier League is very very tough. “I said it all through last season. Part of my job is to not get carried away with it but all last season I said the margins are really fine. So is there anything Dyche has tweaked to change his side’s fortunes? : ““We’ve had a look at players and a look at formats, the individuals – we’ve had a look at the details and the analysis. “We only add facts and stats in. I wouldn’t run the team on how many passes you have, others do but I don’t. “Never forget your eyes in my view, because the eyes can always sense it and feel it, they’re telling you through years and years of being a player, and watching football, and being a coach and a manager, when the players are on it and when they’re not quite on it. “Through a screen you can’t always tell that. So I never go against my eyes but I always use other things, back up and support, or to use and move forward. Lots of details. “The oldest one in the book about us is ‘we play 4-4-2’. By the way five Champions League teams played 4-4-2 on Wednesday night, just out of interest. There’s a myth that no-one in Europe ever plays 4-4-2, apart from five Champions League teams. “Modern football is not played on a piece of paper, it’s played with flexibility and with people moving positions and dropping in, people moving into positions. “Number nines, number 10s, all that sort of stuff. “It’s been there a long time, it’s just more detailed, so we keep adding more detail – can we change it and twist it to be more successful?